25.5.43 A.M. at about 12.15 Brighton had its worst raid yet, 25 planes came over machine-gunning & bombing. I was having Geography & had to get under the desk – I saw 1 Jerry swoop past our window. I was really scared. One boy went absolutely green. The house opposite was machine gunned. At home Mummy got very scared & went under the shelter – Daddy, walking home, rushed inside a shop after seeing bombs falling out of several planes. Bombs were dropped at: top of Eaton Place, Chichester Place, the other side of the hospital in Eastern Road (about 200 yards from here) which was the worst, Bennet Road (near Whitehawk), St Mark’s School (near the gas works), the gas-works – all our gas went, the flats at Black Rock (where we were on Sunday) & where a soldier on the roof was blown out to sea with his gun, the viaduct in London Road (1 span was destroyed) & that’s about all – oh – Arundel Road caught it & Hove was machine gunned. Evening. I toured around the damage – it was awful. Mrs Brooks house, where Daddy lodged was damaged as well. 2 sirens inc raid. Cool and Wet. 29.5.43 Coming back from town on a 41 trolley-bus, we saw the funeral of the two children who were killed in Down Terrace behind our school. I didn’t mention that place on my list on 25.5. 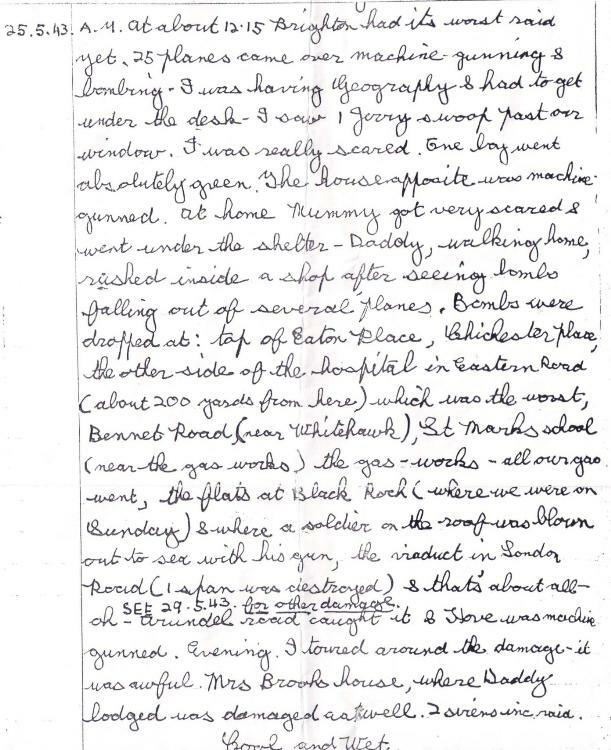 About that raid in 1943 – the list of bombs by Tony was very good. But there is one bomb that was never really recorded and that was the one in Maresfield Road, Manor Farm. It dropped right behind the house that we lived in. 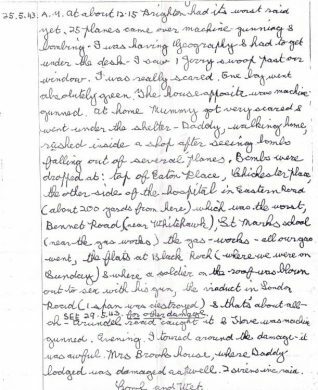 I was at school at the Intermediate and we were having our traumas there as a friend and myself were shopping in Woolworths and had to get back to school for the air raid shelters. There were bombs dropping and machine gunning going on. When I got home Maresfield Road was roped off. I was 12 at the time and when I got to our house I couldn’t find Mum and Dad; I started to scream. Mum heard me – they were up in the bedrooms trying to salvage some things. There were a couple of funny things happened – apparently my Dad (who was fortunately home on leave) said ‘All we need now is for it to rain’, and of course it did. With no roof and dinner on the floor all mixed up with the glass etc my Dad swore at Hitler. They were trying to get things organised when there was a knock on the backdoor (which was only hanging on its hinges); it was the piano tuner who was partly blind and had come to tune the piano. That day was the only day when my placid Mum lost her temper and cursed Hitler. When the viaduct over Preston Road was repaired, my grandfather (Alfred Brooker), a steam train driver based in Brighton, volunteered to take the first train over to test the repair of the bridge. My now deceased uncle told the story of his involvement in the Down Terrace bombing that took the lives of the two children (and adults I think) who had been in the shops that have since been rebuilt. Apparently he had dallied with friends and was late coming home from the Intermediate, so that he missed the impact of the bomb, but had to shelter behind a tree as civilians were being machine gunned. My grandmother, at home in Firle Road, was beside herself with anxiety when he failed to return home at the usual time – but fortunately he did! It’s not much of a story now, but shows just how complete people’s involvement with the terror of war was! My brother, Billy, was one of the boys killed in the Down Terrace raid, when I was 7 years old. To-day is the anniversary of that happening, and it is a day I shall never, ever forget.